By now many people know they should have their Dryer vent Cleaned, we have seen the commercials. But just how do you know who to choose for this? Did you Know that there is national certification for Dryer vent Servicing? WHAT MAKE US DIFFERENT? 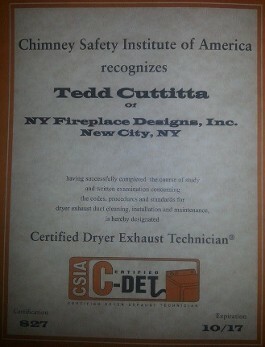 Not only were we at NY Fireplace Designs Inc. the First Company to Achieve the C-DET (Certified Dryer Vent technician) BY the Chimney Safety institute of America. Csia.org We are still the ONLY Company in the area that actually went the extra mile to Certify. This means for you is not only have we been doing this longer with expertise than most other companies, but we have stayed at the forefront of the industry in Training and education. We use tools and equipment other companies do not have. And we are not one of those "fake it till you make it" kind of companies! We believe that to be a professional you need more than just saying you are you need Education, proper tools, experience. We Added dryer vent cleaning to our services over 20 years ago. So you can be assured that you are getting the most up to date skills to clean, check or even repair or re-vent your Dryer vent. An estimated - clothes dryer fires in residential buildings are reported to U.S. fire departments each year and cause an estimated 5 deaths, 100 injuries, and 535 million in property loss. Almost 1/3 of all dryer vents are improperly installed or vented! Animals love to build nests in dryer vents. Gas dryers produce Carbon monoxide that must be vented the same as your Furnace, boiler or water heater? Aa 1/2" buildup of lint in a normal Dryer vent reduces the Ability of the Vent by almost 40%! 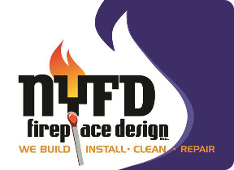 Contact NY Fireplace Designs, Inc. in New City, New York, for more information about our fireplace services.